HELLINGLY ARCHERS OUT AND ABOUT. ​​Not all of our Archers choose to stay at home every week, some of our Archers have competed in Local Club, Charity, County and National Competitions. Regardless of standard, age or ability there are plenty of opportunities for Archers to fly the nest, meet new people and enjoy a day at a different location. Hellingly Archers have competed at Hastings and St Leonards Soup Shoot, the Middlesex County Championships, Surrey County Junior Championships, Eastbourne AC Double Rose Tournament, Lazy Shoot and Junior championships, Doreen Cannon Junior Competition, Ditchling AC Open Competition, Sussex and Southern Counties Outdoor Championships, Allington Castle Archers White friars Competition, Woking Archery Club Open Championships, The National Outdoor Championships, High Weald AC 1440 and WA720 Competitions, Brighton Bowmen Windsor and WA720 Competitions, Crawley Archery Club Charity Soup Shoot. 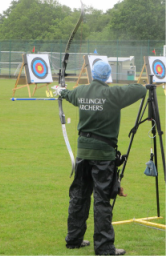 Two of our Archers represented Sussex at the Sussex V Hampshire County Match and a Team from Hellingly Archers competed alongside Blind and Visually Impaired Archers at the Blind Veteran Centenary Competition.